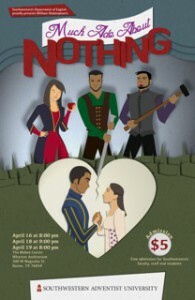 Southwestern Adventist University’s annual spring play will feature one of Shakespeare’s greatest plays, Much Ado About Nothing. It is directed by Dr. Renard Doneskey and will feature Southwestern students as the performers of the play. Much Ado About Nothing displays some of Shakespeare’s most clever and witty dialogue with characters that are charming as well as villainy. The play is set in Messina, a port on the island of Sicily, which is next to the toe of Italy. The spring play will have three performances: April 16 at 8 p.m., April 18 at 9 p.m., and April 19 at 8 p.m. Admission for the play is $5. Southwestern students and faculty get in free. Much Ado About Nothing will be presented in Wharton Auditorium at 300 W. Magnolia St. in Keene.